"How to have more art making time" includes illustrated instructions for common supply distribution processes. Practice these efficient routines to increase art making time! 3. "Raise your hand if you need"
4. 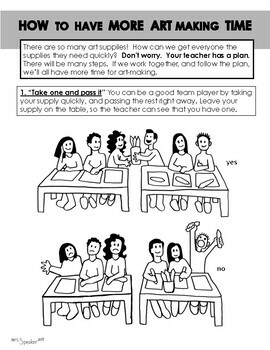 "taking turns by table"
All drawings are original by MrsSpeaker. Copying permitted for classroom use only.